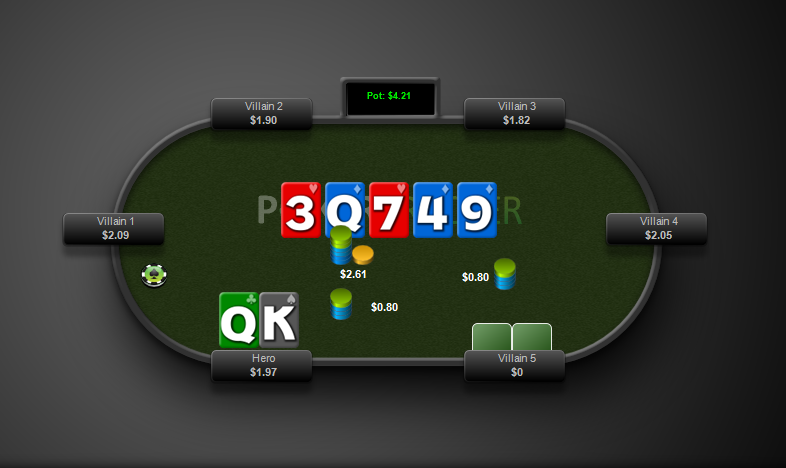 $2 NLHE 6-max: TPGK pursuing three streets of value? Did hero overplay TPGK? Did hero play it standard? What are your thoughts on villain raise on turn/river? Similar Threads for: $2 NLHE 6-max: TPGK pursuing three streets of value? Yes hero overplayed this hand, i think you don't really get 3 streets of action with worse. Check flop probably. KQo we would check flop but with AKo would we bet it? If so, can we (with KQo) be betting the flop when checked to, and checking the turn/river based their call on the flop? It depends on the opponent. In general I also think it is very unlikely to get 3 streets of value with TPGK. When he takes the lead on the turn and shoves the river, I'd say he has something better than top pair. Unless you know he is a maniac. More stats would help to understand better. If you have few, I would not assume he is bluffing. re: Poker & $2 NLHE 6-max: TPGK pursuing three streets of value? Yes Hero overplayed. 6-handed the KQo call in CO is on the light. The question Hero should be asking is, "What do the Villain have that they would raise preflop and then check call the flop?" And then ask, "Which of those hands can Hero beat that would BOTH Villains would call 3 streets with?" Hero's hand is fairly face-up in a penny game. I wouldn't expect BOTH Villains to be playing too tricky. 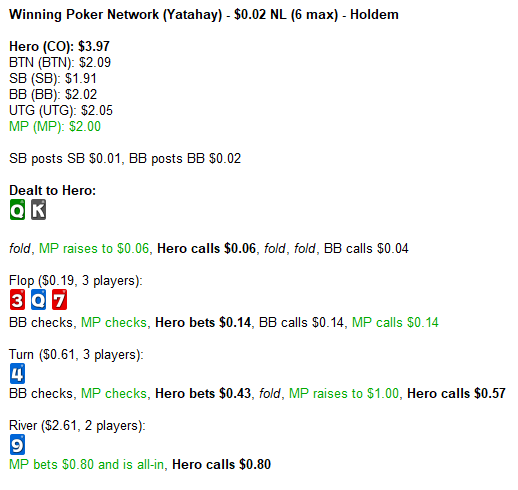 After Hero's raise on the turn one needs to wonder why Villain didn't just call after BB folds? The pot would have been $1.47 and Villain would have $1.37 behind. Instead she re-raised less than 1/3 pot (after her call) leaving less than 1/3 pot behind. Either Villain is really bad (possible in a penny game) or she is sucking Hero in. The flop is damp. the flop bet is OK, but the raise on the turn was ambitious and Hero should realize the turn re-raise with so little behind is effectively an all in. Hero has little chance to improve, 2Q and 3K, or 10% much better to check the turn. I agree that this hand is overplayed. I am fine with the flop bet after the MP who has the lead checks. I would go a little less though, .10 maybe. Both villains call here. MP was the pre flop raiser and has check/called. With no info, I think MP villain is trapping with a big hand, and I'm done putting money in this pot. Maybe if you check back the turn, you can call a small river bet, but I think even that is bleeding equity.